New York : M.K. McElderry Books, ©2007 2007. "Margaret K. McElderry Books, an imprint of Simon & Schuster Children's Publishing Division ; Manufactured in the United States of America ; Book design by Mike Rosamilia"--Title page verso. 485 pages ; 24 cm. this is an excellent book and not just for kids. it will hold the attention span of any young adult. i wont push it and say its for all adults i found it interesting but i wont speak for everybody. it follows a young girl and her friend on a journey to the super natural world that exists all around them. with a painful twist at the end you wont be able to put it down. and then you'll be running to the book store at three in the morning for the next one. City of Bones describes Clary Fray discovering her Shadowhunter background. Now 15, Clary is able to see through the glamour and have the Sight. Her mother has gone missing and Clary is trying to find her. Gathering all the puzzle pieces of her past is difficult, but even more difficult than Clary ever imagined. This book was excellent because the author used a suspenseful storyline with secrets popping out of nowhere. It makes you keep reading until you're done. The book's words play like a movie in your head the way she describes everything. You'll want to keep reading the whole series. Add tags for "City of bones". YOUNG ADULT FICTION -- Fantasy -- Dark Fantasy. 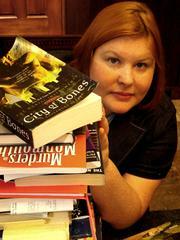 YOUNG ADULT FICTION -- Romance -- Paranormal.